Weather Data from the Bridge. 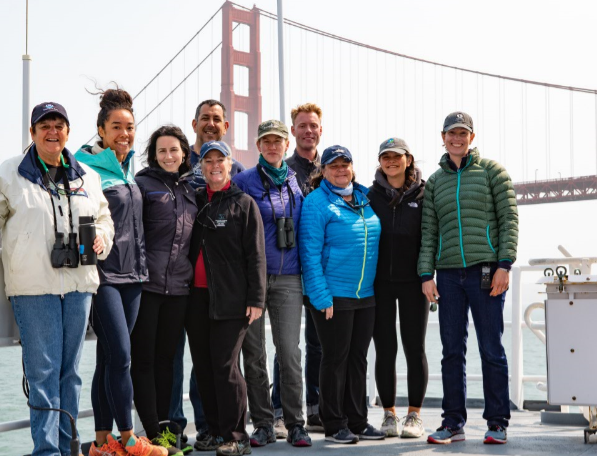 After leaving San Francisco Bay, yesterday we headed west and spent the day getting our “sea legs” and collecting observations of marine mammals and birds in the Greater Farallones National Marine Sanctuary waters. We began collecting data around 1300 hrs from 37° 47′ 52.4“ N 122° 53’ 31.2” W and headed west towards the continental shelf break approximately 30 miles off shore. Throughout the day we followed a series of predetermined tracks (referred to as transects) and collected counts of the abundant life thriving in the sanctuary. We saw numerous Blue Whales, Fin Whales, Humpbacks and dolphins. 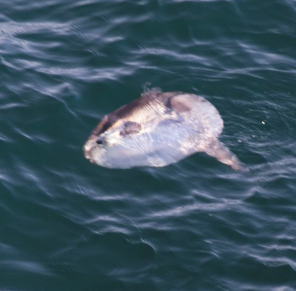 We also had a sighting of a strange prehistoric looking fish called a Mola mola (common name: Ocean Sunfish). Mola Mola are the largest bony fish in the world and are playfully described small dinner plates and can grow to as large as a smart car. They tend to live in deep water so seeing one at the surface is a real treat. Their distinctive dorsal and ventral fins are quite long and their pectoral fins (the ones on the sides) are quite short and stubby. They dine on jelly fish and need to eat a lot in order to develop and sustain their substantial bulk. Members of the ACCESS survey team have observed Mola slurping up Velella velella ( common name: Sea Raft) a type of free-floating hydrozoan that lives on the ocean surface. The terms “port” and “starboard” are used as to indicate the left and right sides of a ship. “Starboard” comes from the Old English “steorbord”, meaning the side on which the ship is steered. Before rudders (which are located in the centerline), early ships had a steering oar and because most people are right handed it was located on the right hand side of the ship. Because the steering oar needed to be out of the way when docking the opposite side of the boat traditionally was the side that was closest to the pier. Hence “port” refers to the left side of a ship if you are looking towards the front of the ship. The front of a ship is called a “bow”. This entry was posted in 2018, NOAA Teacher at Sea, Pamela Schaffer and tagged Cordell Bank, Greater Farallones National Marine Sanctuary, NOAA Ship Bell M. Shimada. Bookmark the permalink. I never knew that about starboard and port… how cool!